Someone once famously defined madness as doing the same thing over and over and expecting different results. By that definition I’ve had more than my share of lunacy. One of my most entrenched character flaws is stubbornness. I think it could take the emotional equivalent of a nuclear bomb to shake that one out. Hmm, I wonder why? Truly stubbornness stands me in good stead for some ventures. Take, oh, I don’t know. Maybe writing? Seriously, in this day and age you have to possess the tenacity of a mixed breed pit bull/mule in order to have a hope of being published. So in that sense, continuing to plug along is the right thing to do. Even it requires a course adjustment or two or ten to get things right. At some point there comes a moment when banging our heads against a closed door morphs from begging entry to a mere symptom of concussion. The trick is to discern when, because it varies for every situation. I’m learning that God may have good reason for closing a door that I desperately want to go through. At least I’m trying to. It ain’t so easy when I’m in the middle of a long hallway with a closed door in front of me, and the only other option seems to be going backwards. You see my husband and I have been appointed missionaries for the last six years. Before that, we were associates in missions (kind of like junior varsity.) We met in Bible School and got married with the understanding that missions was our passion and that we would spend our lives together overseas. Things progressed according to plan. We went on our aim trip and it was successful and fulfilling and challenging, and all the other wonderful things we thought it would be. We received our appointment and ordination. Had a couple kids, and everything still seemed on track. And then God began the switch up. He changed the field of our calling. Yikes! Unexpected, but hey we can roll with the punches. We presented the change of field request to our missions board. And they told us no. Aack! We prayed. We sought counsel. We took a short trip to the nation in question to see what God would tell us. In the end we felt that God would honor obedience. And so we went ahead with our original plans. IN our heart of hearts we thought that perhaps we would finish a term or two and then try again for a field change. Our ultimate goal was deferred for a time, but not in any way crushed. We’d still be doing what we loved most. And then we couldn’t raise our budget. (Even though the nation of our appointment is in Africa it’s one of the most expensive in the world.) We did it all by the book. Our numbers were average, but not great. We tried for unusual solutions. It didn’t work. We are in no way perfect, we made our share of mistakes, but nothing we tried seemed to work. And all the while we kept banging our heads against the proverbial door. A couple of months ago everything seemed to fall apart all at once. A sickening roller coast ride ensued with us strapped into a rickety little car, unable to get off no matter how sick we were to our stomachs. We had become trapped in a political wrangle. And as we swung between hope and despair we finally had to confront the fear that maybe, just maybe, we weren’t going to be missionaries after all. We made one last ditch effort to try to change fields. It would be cheaper to operate there after all. It culminated with a painful board meeting where we were given 2 choices, both of which were non-choices. Take our four-year-old and six-year-old to Africa without sufficient funds to live on, or resign. Hurt and frustrated don’t even begin to describe the emotions that roiled around within me. I told Joel that it was like suffering a miscarriage. All our hopes, and plans and dreams were dead. We were grieving… and angry. And not just with men. I’ve been totally and completely mad at God. How could he abandon us like that? How could he let agendas and politicking overcome what he led us to do? I wonder why we didn’t just quit years ago when the board told us no. Surely that would have been easier for all concerned? So for the past month I’ve been trying to reconcile all this and come to terms with what feels like the end of all things. I still don’t have all the answers. I don’t get it at all in fact, but I’m trying to cling to the idea that my lack of understanding doesn’t change who God is. This hasn’t happened because we are being punished, but because he has something better in store for us. I know it’s true because God has taken the time to meet me even in the midst of my most despairing, angry moments. When I wondered if he hated us, and railed at him for putting us through all this. He’s whispered love and healing to my heart. He’s given me the gift of his presence and spoken to me through sermons. I confided in my husband that it felt as if we’d lost so much more than a job, or even a calling. The grieving process isn’t over. Some days are better than others. I think it will still take awhile for full healing to occur. There may always be some pain. I'm a work in progress. But I know that God has a plan. And that I’m better off with him, than by myself. Oh, and I’m done banging my head against this particular door. Have you ever been forced into a detour? Did it work out? What advice do you have when all the doors seem shut? Lisa, you know all of the Inkies are praying for your future plans. Sometimes I'm the opposite, not stubborn enough. If something's not easy, I just want to say, "Oh well, must not be God," and move on. I'm having to learn to stand firm and fight for the things he's called me to. Good morning, Lisa. Oh, my heart still hurts for you. I'm truly sorry you've had to experience this. I would encourage you to continue to focus your eyes on Him. Know that He hurts with you. He's holding you in His hand and you are precious to Him. Try not to forget that. I know it's easy to forget when your heart is breaking. And I'll be right here praying you'll feel His presence surrounding you. I hope this darkness lifts quickly, my friend. I'm sending you lots of love and hugs. Dina, you bring up an interesting point. We need a balance. Knowing when to stand firm and when to yield has to be something that comes with spiritual maturity. Suzie, I so so so appreciate your prayers. My Inkie sisters have kept me going in a lot of ways lately. But I do want to note that I wrote this post in the hopes that it would help someone else who may be struggling with not knowing what God has in store. Or maybe even minister to someone who has been hurt by people who should have protected them. We were kind of talking about this in our secret base under Inktropolis and Gina (I think) said something along the lines of I just need enough faith to not need the answers. That wasn't exactly it, but the point is that I may find out next year why we've gone through all this. Or I may never find out. My faith has to be more important than my need for answers when bad things happen. If it's not, then it was never worth having in the first place. I was debating whether to share this with Lisa privately, but based on her last comment of helping others in similar situations, I'll share it here. I've been thinking and praying about Lisa all morning, and this is what I feel like God said. "What are the barest bones, the deepest heart of your calling?" Sometimes God gives us a calling and we logically connect it to other details and particulars. I feel like God is saying to strip back to the barest bones of the calling he gave you and to rebuild from there. That sounds like the sort of Godly wisdom that could apply to others as well. I know I've had to do that on several occasions. Dina, Thank you for that. I appreciate your prayers!! You're so right. Missionary work can be done right down the road. Anymore the 'unchurched' are everywhere and they need to hear the gospel as much as anyone else. I don't know WHERE God will direct us next. But I need to be about his business here and now. Lisa, what a beautiful post: your transparency blessed me and I am sure that God will use it to help and inspire others. You remain in my prayers, and I trust that God is working something mighty in you. There have been a few times in my life where I believed I was doing God's will, and things crumbled. In one situation, I still don't know why things went wrong, but I believe that He had me in His care the entire time and there had to have been a purpose in it, somewhere. Jesus told us we'd have trouble, but to be brave because He has overcome the world. I need that word now, too: God is with me in these problems, He's the potter and the Creator, not me, and He can handle my trouble. I pray that you're comforted through this difficult time. It's so easy to fall into being defined by what we do instead of who we are in Christ, isn't it? Missionary, writer, mother, wife. And yet any of those "titles" can be snatched away from us at any time. And the Lord doesn't hesitate to allow it when we need to understand our deeper need to define ourselves in HIm alone. I've SO been there!!! But I love that God's love for us is so extravagant that He doesn't even hesitate to let us walk through hard times when they are for our good and His glory. Sometimes we think His love only shows when we are blessed. But I think perhaps the depth of His love is only really known in the hard times. At least that's when it come more clear to me. Praying that the Lord will illumine the path you are to walk as well as give you joy in the new journey . . . So when I started reading this post, I thought it was Jill writing it, but when the talk turned to missionaries, I guessed it was Lisa. But it could also pertain to Patti who's run up against a similar wall and has left everything in God's hands for the coming weeks. And yes, this applies to so many of us and others. I guess the thing is that even when we're convicted God wants us to do something, we still have to listen for changes to His plan and trust Him to lead us. God's plans are perfect, but we need a whole lotta work. 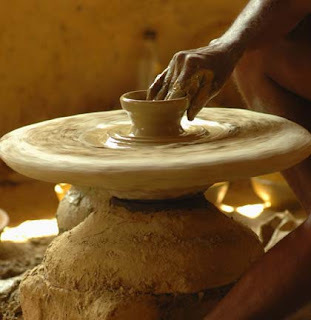 I love that pic of the potter's wheel. Thank you for this post and for reminding me that every day is a learning curve. Susie you are such a sweet friend. I'm so blessed to know you. Thanks so much for your prayers and encouragement. You enrich my life! God's love for us is so extravagant that He doesn't even hesitate to let us walk through hard times when they are for our good and His glory. It's so true, and I didn't convey that as well as I wish I could have. Luckily my Inkie sisters have my back! They bail me out constantly and make me look good. Thanks Anita. It was my sincere hope that someone else would be able to draw strength from this post, even if only from knowing they are not alone. I don't typically like looking like a failure (which is one way I was characterizing all this to myself until recently) and so I hadn't acknowledged any of this to anyone outside the Inkies, our pastor and his wife and a few local friends and family. It just hurt too much. But I guess this is my declaration of freedom. I'm not perfect. I rarely have it all together and the thing I wanted most is out of reach for the time being. But I am still amazingly and wonderfully blessed. God hasn't changed and he has something great planned. Great soul searching post. It eases my guilt in wondering where God is in the picture. I had to repaint my picture of what a family looks like when I got divorced. Then, I felt called to do music at my church, only to be treated with more disrespect and be let down by the "godly" people I had turned to to build me back up. Why would God put me through that?!? Why did I feel called to share my gift only to be hurt? So, I switched churches and have found a new home. I'm welcomed and loved and affirmed. I play once a month, which is probably the best fit as a mother of four! It's confusing. You wonder if you're working too hard for the wrong things, or not hard enough? Still searching, still growing, still walking the journey. Mary I'm so sorry you had to go through that. For myself I tend to expect more from Christians. More love, more kindness, more compassion. When they let us down it hurts more because our expectations have been dashed as well as our hearts. I think we take change as a sort of reprimand. I know I don't like it. Give me the rules and don't change them! It was easy to see how much this change hurt you because, as you said, we take things and wear them. Our labels help us organize ourselves. I'm sorry I didn't see the fact you felt like you failed. It didn't occur to me that your family had done anything wrong--"failed". So we all look at things so differently. I like Dina's suggestion to go back to the 'bones'. I think it's just a call to be a servant. Jesus kept trying to tell the disciples that while they kept trying to label what He was doing. I absolutely know that you will look back on this and, even if you never understand it, you will see the benefit to God's kingdom. Deb, you're right, I need to cultivate a servant's heart. It's so important. Bacl to the basics and let God rebuild our ministry from there, huh. Lisa - you HAVE a servant's heart, believe me! It's obvious to all of us! You are doing just what you've been called to do RIGHT NOW. Ready and willing to serve. Your willingness to share this will bless someone, I'm sure (well, beside us - we think you're awesome and we have an awesome God). I think some loud Veggie Tale music is called for here! Lisa, thanks for sharing your struggles and I'm so sorry your original plan didn't work out. It's difficult when it seems like God is denying us our heart's desire for no apparent reason. I think sometimes He knows things we don't and we have to trust that He has our best interests at heart. I think back to a time when we had to move interstate. Every door that would allow us to stay slammed in our face and I really didn't want to move. What I didn't know at the time was one of my kids had a health issue and moving to a new city provided us with the exact resources that we needed, resources that weren't readily available near our old home. I now look back at that time with a different perspective. Ooh, Deb, I agree a resounding chorus of The Pirates Who Don't Do Anything. Everyone sing along! Thanks for the kind words. I really appreciate you. Yep, Narelle. I've had a moment or two like that. Once with a job I was certain I was going to get. Couldn't understand why I didn't. But then later God blessed me with the perfect situation. I think it's those small milestones that keep us going when the road looks like it's dropped off a cliff. Those memorials that remind us of God's hand in our lives make it possible to keep going when the world falls in around us. Hmm that's very interessting but honestly i have a hard time figuring it... wonder what others have to say.. Here I am, late to the party as usual! Lisa, thanks for such an honest sharing of your heart. I no it will bless others who have had big doors slammed in their faces. I've got a "slammed door" story, but you've all heard it before, so let me share another. A person who is very close to me felt beyond doubt that God called him to minister in the area of healing. But years went by and when things didn't transpire the way he expected them to, he became discouraged to the point that he stopped going to church. After a lot of prayer (years of it, actually) he finally realized that he'd boxed God in and tried to limit how He would work in his life. This man is still a work in progress (aren't we all?) but he's finally starting to see that God gives him his identity. Thanks for sharing that, Jen. Sometimes I think God shows us something that will happen, but we always assume it's going to happen now, or at least on our time table. This Abraham and Sarah or even Joseph and his dreams. Did he really think that by telling his family about them they would all just bow down? Nope it took years as a slave and convict before his dreams saw fruition. Lisa, I could SO relate to you with this, esp. as it pertains to ministry things. I keep going back to the verses that say "God chooses the foolish things to confound the wise." We don't always know what He's doing or why, but we CAN know that He has our best interests at heart and He will work things out for good! Sometimes, Niki, I think it's enough to know I'm not alone. Truly guys this post and all these comments have been very cathartic for me. I didn't intend to force you all to step into the role of counselors, but I sure have appreciated all the comments and advice. The inkwell is most definitely a place of healing and hope!